Building a real-life version of the Star Trek tricorder has been the goal of engineers and hackers alike since the first time Dr McCoy complained about being asked to work outside of his job description. But while modern technology has delivered gadgets remarkably similar in function, we’ve still got a long way to go before we replicate 24th century Starfleet design aesthetic. Luckily there’s a whole world of dedicated hackers out there who are willing to take on the challenge. [Taste The Code] is one such hacker. He wanted to build himself a practical gadget that looked like it would be at home on Picard’s Enterprise, so he gathered up the components to build a hand-held heart rate monitor and went in search for a suitable enclosure. The electronics were simple enough to put together thanks to the high availability and modularity we enjoy in a post-Arduino world, but as you might expect it’s somewhat more difficult to put it into a package that looks suitably sci-fi while remaining functional. Internally his heart rate monitor is using an Arduino Pro Mini, a small OLED screen, and a turn-key pulse sensor which was originally conceived as a Kickstarter in 2011 by “World Famous Electronics”. Wiring is very simple: the display is connected to the Arduino via I2C, and the pulse sensor hooks up to a free analog pin. Everything is powered by 3 AA batteries delivering 4.5 V, so he didn’t even need a voltage regulator or the extra components required for a rechargeable battery pack. Once everything was confirmed working on a breadboard, [Taste The Code] started the process of converting a handheld gyroscopic toy into the new home of his heart rate monitor. He kept the battery compartment in the bottom, but everything else was stripped out to make room. One hole was made on the pistol grip case so that a finger tip could rest on the pulse sensor, and another made on the side for the OLED screen. This lets the user hold the device in a natural way while getting a reading. He mentions the sensor can be a bid fiddly, but overall it gives accurate enough readings for his purposes. If you’re more interested in the practical aspects of a real-life Star Trek tricorder we’ve seen several projects along those lines over the years, including a few that were entered into the Hackaday Prize. The Parker Solar probe honors living astrophysicist [Eugene Parker] who theorized a great deal about how the sun, and other stars, emit energy. His work has rightly earned him the honor of seeing his name on a sun-bound probe. We even owe the term, “solar wind” to [Parker]. To draw more attention, you can have a few bits aboard this probe dedicated to you or someone you care about by adding your name to their list. Or you can send the name of your greatest enemy into the hottest furnace for millions of miles. Your call. Even though our sun is the most prominent heavenly body, NASA hasn’t sent a probe to explore it before. They are good about sharing their models and they really know how to write standards for workmanship. Over a decade after the last Star Trek show warped off of television, we finally have a new series in the form of Star Trek: Discovery. But much to the chagrin of many old school Trek fans, Discovery has gone all in on the gritty and hyper-serialized storytelling that’s taken over TV since Starfleet last patrolled the airwaves. But for those who are looking for somewhat more lighthearted space adventures, Seth MacFarlane (of Family Guy fame) has created a show which is essentially a love-letter to Star Trek: The Next Generation called The Orville. Some have gone as far as to claim that The Orville is the true continuation of the Trek legacy, though such discussion sounds awfully close to a Holy War to us so we’ll steer clear. Unfortunately for The Orville fans, the series doesn’t have nearly the commercial draw of Trek. Accordingly, the market for things like replica uniforms and props from the show is still in its infancy, meaning fans of the show have to go the DIY route. 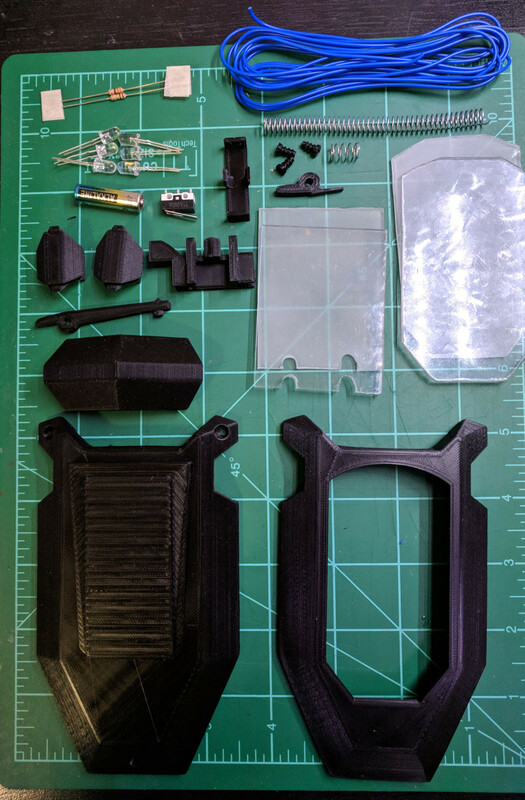 [JohnSmallBerries] is one such fan, and his 3D printed “Comscanner” from The Orville is a shot across the bow to the well established Trek prop-making scene. Without so much as an official toy version of the device, [John] was forced to do his initial 3D rendering based completely on screenshots from the show. Even the scale of the device had to be guessed, as it’s usually only seen being held in a crew member’s hand. In the end he reasoned it’s probably supposed to be about the size of a large smartphone. Not content with just a static prop, [John] managed to integrate not only the spring-assisted retractable display of the scanner from the show, but also some LED backlit panels complete with a screen-accurate user interface. Judging by the internal shots of the scanner, it looks like there’s still plenty of room inside to add some more advanced electronics. The next evolution of this prop will surely be to add in a microcontroller and potentially even a real screen to add some more elaborate effects and (relatively) practical functions. We’ve seen plenty of impressive builds of Star Trek gadgets, arguably bringing the devices much closer to reality than the original show runners ever did. It will be interesting to see if The Orville inspires a new generation of engineers to bring their favorite fictional pieces of kit into the real world. We’ve all been there. 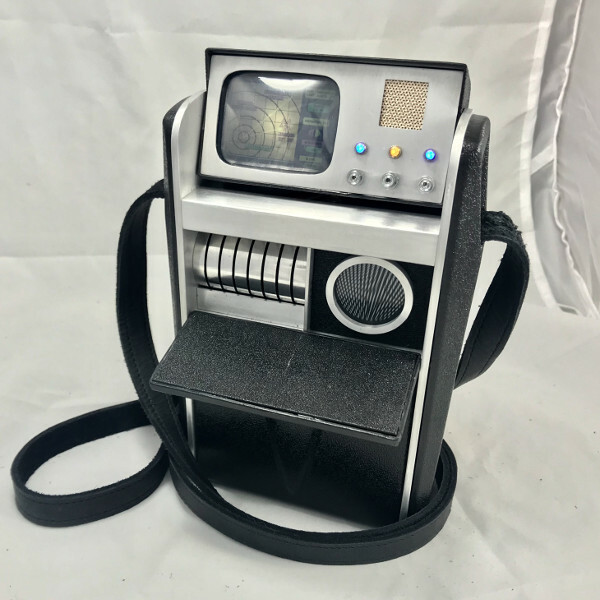 You want to assemble a proper Star Trek: The Original Series landing party prop set, but the TOS tricorders you can find on the market are little more than overpriced toys. Imagine the embarrassment of beaming down to Cestus III with a plastic tricorder. The Metrons wouldn’t have even bothered with the trial by combat with such a sorry showing. Unhappy with the state of Star Trek props, [Dean O] decided to take matters into his own hands. He purchased a TOS tricorder from Diamond Select Toys and set out to modify it into something a bit closer to Starfleet standards. Anything painted metallic silver on the toy was replaced with a machined aluminum duplicate, adding some much needed heft. He even spruced up the controls and display. To start, [Dean] stripped the tricorder down, separating all of the silver plastic parts and finding aluminum stock that was close enough to the desired dimensions. This ended up being .125″ plate for the sides, and .500″ bars for the horizontal dividers. To make the side panels he placed the original plastic parts over the aluminum, marked the mounting holes with a punch, and used the belt sander to shape them. [Dean] then put in a more screen accurate Moire disc, and went as far as to get real watch crowns for the buttons (just like the prop used in the show). 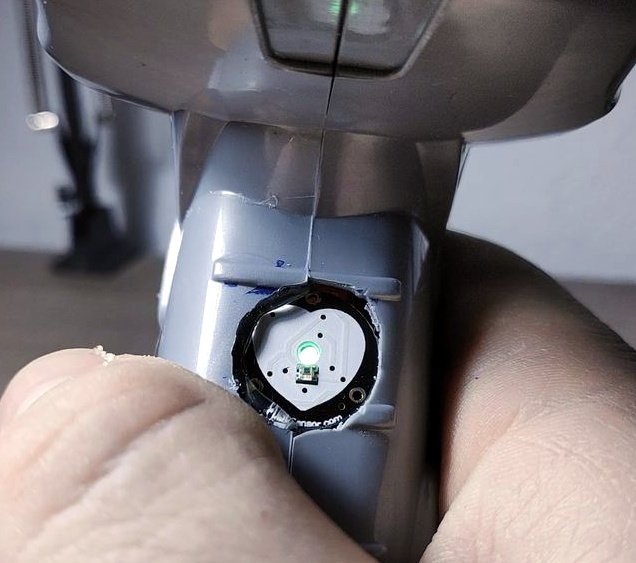 In a particularly bold move, he even drilled out the center of watch crowns to install plastic light pipes for LED illumination. Last year we saw a build that crammed a Raspberry Pi into the same Diamond Select tricorder toy to excellent effect. Now somebody just needs to combine both projects and they’ll have the slickest tricorder in the Alpha Quadrant. We are saddened by the passing of physicist Stephen Hawking. One of the great minds of our time, Hawking’s work to apply quantum theory to black holes launched his career and led to his best known theoretical discovery that black holes emit radiation, aptly known as Hawking radiation. Thinking back on Stephen Hawking’s contributions to humanity, it strikes us that one of his most important is his embrace of pop culture. While his scientific discoveries and writings are what will stand the test of time, in our own age it is remarkable that Stephen Hawking is a household name around the world. 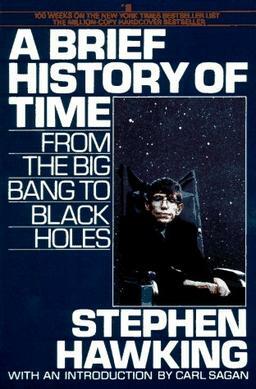 Hawking’s first book, A Brief History of Time, has sold more than 10 million copies and for many readers was their introduction into the way physicists view space and time. It was written for general consumption and not reserved for those who were already bathed in the jargon of theoretical physics. It sent the message that contemplating science is something that is fun to do in your spare time. This work continued with his more recent mini-series Into the Universe with Stephen Hawking created for the Discovery Channel. A fan of the series, Hawking appeared in an episode of Star Trek: The Next Generation in 1993 and made subsequent, often repeat, appearances on The Simpsons, Futurama, and The Big Bang Theory. This was great fun for all science geeks who knew of his work, but it has a far more profound effect of normalizing interaction with a world-class scientist. Appearing on these shows told the story that the pursuit of knowledge is cool. Having scientists in the public light is crucial to research and advancement. It lets the general public know what kind of frontiers are being pursued, and why that matters. This trickles both up and down, inspiring the next generation of scientists by introducing deep topics at an early age, and ensuring funding and opportunities for this upcoming wave of researchers has widespread support. Stephen Hawking showed us some incredibly complicated secrets of the cosmos both through his discovery, and through his ambassadorship of scientific knowledge. He will be greatly missed but leaves behind an admirable legacy which we can all strive to live up to.